The Pony Car market was red hot in 1967. After seeing what Ford had in the Mustang introduced three years before, the other manufactures jumped into the game big time. General Motors had two entries in the game, the Chevy Camaro and Pontiac Firebird which shared the same F-body platforms. There were differences between the two cars. The Firebirds bumpers were integrated into the design of the front end and its rear “slit” taillights were inspired by the Pontiac GTO. For GM, the Firebird was their Plan B for Pontiac, who had initially wished to produce a two-seat sports car of its own design, based on the original Banshee concept car. However, GM feared such a vehicle would directly compete with Chevrolet’s Corvette. Whoa….can’t do that. Instead, let’s just have it compete with the Camaro. The Banshee was really a cool car and too bad some product manager had his toes stepped on. Back to the Firebird which was not really a bad Plan B. Since Pontiac was the performance division of GM, there were two V8 engines: the 326 CID (5.3 L) with a two-barrel carburetor producing 250 hp; the “H.O.” (High Output) engine of the same displacement, but with a four-barrel carburetor and producing 285 hp or the 400 CID (6.6 L) from the GTO with 325 hp. In 1969, it was off to the races as a $725 optional handling package called the “Trans Am Performance and Appearance Package,”, named after the Trans Am Series, which included a rear spoiler, was introduced. Of these first “Trans Ams,” only 689 hardtops and eight convertibles were made. Click on this image to see the show’s open. Of course where were some very famous Firebirds. Starting in 1977, the Firebird, and more specifically the Trans Am, received a number of roles in big movies, most of which starring Burt Reynolds. Later on a Trans Am, named KIT was he star of Knight Rider. What to take a guess on what KIT stood for? Cue the Jeopardy music….. Give up? Knight Industries Two Thousand. “Knight Rider, a shadowy flight into the dangerous world of a man who does not exist. Michael Knight, a young loner on a crusade to champion the cause of the innocent, the helpless, the powerless, in a world of criminals who operate above the law.” Sorry, I watched way too much TV. Promo model prices are on a similar scale with the real deals in that the tougher ones to find cost more to own. The first generation 1967-1969 Firebird promos were available in coupe and convertible and generally two or three colors for the coupe and one or two colors for the convertible. Many of the first generation promos have become difficult to obtain in presentable condition. This is due to the fact they were given to small children to play with making the attrition rate very high. I can attest to this myself! According to John M. Witzke, who writes for the Firebird Gallery website, the 1968 Firebird Convertible is one of the rarest Pontiac promotional models and is considered the most sought after of the first generation models. Value of the first generation Firebird promos in near mint condition generally range from approx. $225.00 for a ’67 coupe to $475.00 for a ’68 convertible. The first gen, 67-68 tend to command the higher prices for collectors. When the second generation was introduced in 1970, prices dropped in about half to around $180 until 1974 where they can be found for around $50. The second gen is considered to be a good starting point at collecting. This was, and still is, a great car. 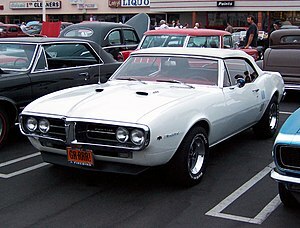 There are several factors on why the Firebird has joined the orphan class, one being simply bad management at Pontiac. Too bad since the Camaro, which was killed with the Firebird and now the Camaro is back. I think there is an after market company which is taking the new Camaro and giving it a look similar to what the real deal could have been.